The natural world is a wellspring of artistry, architecture and aesthetic design. From the rocks to the creatures that wander and flutter, nature provides some of the most intriguing and exciting interior design elements and home accents imaginable. Earth’s Treasures, “Bozeman’s Lil Museum and Mining Store,” showcases natural wonders from around the world. Indonesia’s climate and ground minerals have transformed their ancient wood into lively, multihued petrified wood that can be used as end tables, pedestals or seating around the fireplace. Cut and polished tops accentuate the striking wood grain, while the sides of the stumps are left unadorned and rustic. Placing a beveled edge, rectangular piece of glass on top of two matching stumps creates a beautifully refined coffee table. The logs are also cut into thick slabs, creating impressive wall hangings that become the focal point of any room. A petrified wood sink, however, is truly an interior designer’s dream. The sink sides are untouched and a bowl is polished out of the top; a custom faucet completes the one-of-a-kind utilitarian piece of art. Pakistan and Mexico have beautifully colorful onyx, a stone that shows the layers of formation in a swirling of green, red, yellow and white. Once the stone is quarried, the local artisans begin their craft, shaping sturdy, yet decidedly delicate, wine goblets, champagne flutes, platters, plates and bowls. Although paintings are the most common way to decorate a wall, nature provides a myriad of more fascinating choices. Artists have learned how to collect butterflies after their natural death, spread their wings and decoratively frame them for colorful, varied and unique displays. Insects most often considered pests could actually become treasured works of art. Having framed bugs in your design arsenal is like a secret weapon: unexpected, yet captivating. Some bugs are chosen for their natural colors, like purple-winged locusts or turquoise beetles, while other bugs are chosen for their large size or unique features, such as the giant stick bug with spines or rhinoceros beetle. 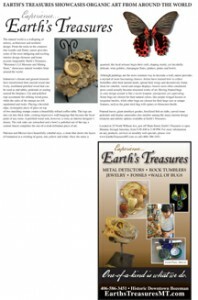 Framed leaves, giant amethyst geodes, fossilized fish on slabs, carved stone pedestals and display ammonites also number among the many interior design elements and artistic options available at Earth’s Treasures. Located at 25 North Willson Ave, just off Main Street, Earth’s Treasures is open Monday through Saturday, from 9:30 AM to 5:30 PM. For more information on any products, services or monthly web specials, please visit www.EarthsTreasuresMT.com or call (406) 586-3451.